MENTOR & PROTÉGÉ: Botso Korisheli (left) will guest conduct his former pupil, violinist Sal Garza (right), in a SLO Chamber Orchestra concert on March 22 in Arroyo Grande’s United Methodist Church. OK, let me back up a second so we’re all clear. Botso Korisheli is a famed sculptor, music teacher, and subject of the documentary Botso: The Teacher from Tbilisi, which chronicles his early life in the U.S.S.R.-controlled Republic of Georgia, his survival of World War II, and his eventual life in Morro Bay where he taught several generations of musicians, including one Salvador Garza. The plan on Sunday, March 22, starts with the SLO Chamber Orchestra’s Spring Concert at 3 p.m. in Arroyo Grande’s United Methodist Church (275 N. Halcyon Way) with Sal and Botso as guest stars. That evening, at 7 p.m., the documentary on Botso will screen at The Palm Theatre, and right before the screening, Sal and the SLO Chamber’s principal cellist Bob Liepman will provide another short musical program. 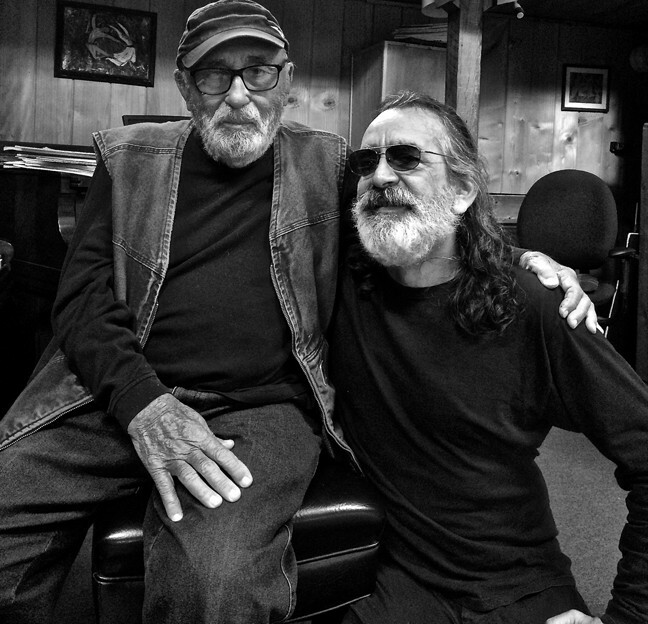 So, I first met and interviewed Sal in the ’90s when he was a garbage man in Morro Bay. He told me about how he found a violin in the trash and customized it for use with the ’80s alt-rock band Downy Mildew. This was, of course, after he’d been classically trained by Botso. We couldn’t find a time to sit and chat so he emailed me, in his special quasi-incoherent way, all the important stuff he thought people needed to know. “Botso doesn’t even know, also, that I didn’t even learn to read music until grade five. Mom started me on the violin in second grade. There was a lot of fakery—some will call it improvisation—on my end. It actually forced me to acquire absolute pitch, which still didn’t make me practice when studying under Carol Kersten. She turned me on to Jean Luc Ponty when I was 12. “My brothers’ and sisters’ eclectic tastes in classical and modern music styles did very much cause me to reach out and learn drum theory, the rudiments, and eventually, yes, I serve as a ‘real,’ rock and roll drummer. You can fact check with Mary Jeanne Ramsey [who replaced Natalie Merchant] of 10,000 Maniacs on this, as I had once put a band together for her in 2001, of SLO musicos (Caleb Nichols, Gary Burke, Tyler Mitchell), and we played all Maniacs tunes in L.A. City Hall … whatever. “Getting back to basics and overall name dropping, when we (Mary Ramsey of 10K maniacs and Ted Mason of Modern English) were to do another charity benefit at the Kennedy Compound in Hyannisport, Mass., in 2004 for Best Buddies Intl., the obligatory background check had to be done on me; and when our itineraries were mailed to us (first class tickets and accommodations there and back to SLO), mine read, ‘Sal, go to Mexico.’ Go figure. “I think the highlight of my musical path, besides reconnecting with Dr. Korisheli after 33 years (a very happy reunion at that; he is almost a hundred years old) is that this concert is a great testament to local talent and in that it’s a community orchestra that has developed rapidly over the last 10 years. Keith Waibel, conductor of the SLO Chamber, is all about the music and having fun. Oh yeah, that’s probably why my dearly departed dad couldn’t understand why I played any chance I could, and it didn’t matter if it was for dinars or doughnuts. YOUNG AT HEART: Greg “Spanky” Baldwin will release this third album at Grover Beach’s Manrock Brewing Company on March 20 before leaving on his fifth national tour. Here’s your chance to see two fellows—Sal and Botso—who’ve lived incredible lives, incredibly weird in Sal’s case and incredibly inspiring in Botso’s. Advanced tickets to both the concert and the movie are $20, and I believe they’re limited to 120, so call 528-7795 to get yours. Talk about a late-in-life success story! Pismo Beach’s Greg “Spanky” Baldwin spent his musical life playing Grateful Dead covers in bands like The SkyDogs, but at age 50, he started writing his own songs, recording original solo albums, and embarking on national tours he booked himself. This week, he kicks off his fifth such tour. He got some national attention on his second one when he dropped his pants on the steps of the U.S. Capitol in D.C. and performed a song. His third album, the 46-minute, eight-song CD Nobody Here But Us Chickens, will be released this Friday, March 20, at 6 p.m. in Manrock Brewing Company (1750 El Camino Real, Grover Beach; all ages), after which Spanky will embark on another national tour. “I had pretty much sunk all my eggs in the music basket and was heading across the country on tour for the first time,” Spanky recalled of his Coop’d Up tour. “I was just hoping to make it back in one piece and not be too scarred up. Well, I’ll tell you what. It was the best thing I ever could’ve done. I ain’t makin’ no money to brag about, but I have been lucky enough to travel to places I never would have went without music, and I have been able to form some great friendships with people all over the country. Some are like family to me now. I think you will hear the people and the pavement in my songs … and the whiskey. DEEP ROOTS: Hear the backwoods wailing of Drunken Prayer on March 20 at Libertine Pub. ON THE ROAD: Husband and wife duo You Knew Me When (Karis and Cie Hoover) has been on continuous tour for two and a half years, and on March 21 they’ll bring their Nashville sounds to Luna Red and then to Pappy McGregor’s on March 28. 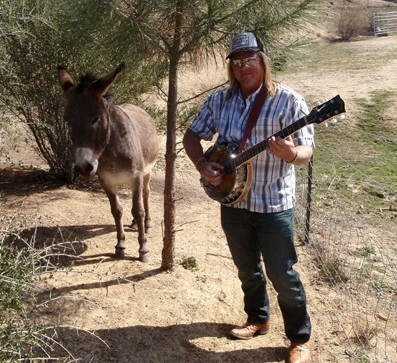 Spanky’s definitely got some help from his friends on the new record, which was recorded by Chris Unck at High Lonesome in Joshua Tree and includes guest appearances by Rizorkestra and Victoria Williams! His deep resonant voice and folksy narrative tunes reveal a depth of spirit well beyond his aging surfer dude persona. 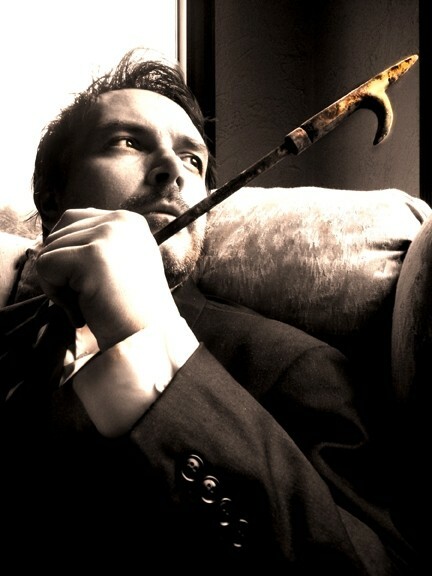 Check out Spanky this Friday and send him off in style. It’s a big old world out there, and you never know if Spanky will make it back alive. on Friday, March 20, at Libertine Pub. Husband-and-wife duo You Knew Me When has been on continuous tour for two and a half years, and this Saturday, March 21, they’ll bring their Nashville sounds to Luna Red (10 p.m.; free) and then to Pappy McGregor’s next Saturday, March 28 (8:30 p.m.; free). They’ll release their sophomore album We Found Roads on April 14. BLUEGRASS BANJO KING: The great Eddie Adcock and his musical partner and wife, Martha, plays March 25 at Last Stage West and March 26 at a house concert near Santa Margarita. 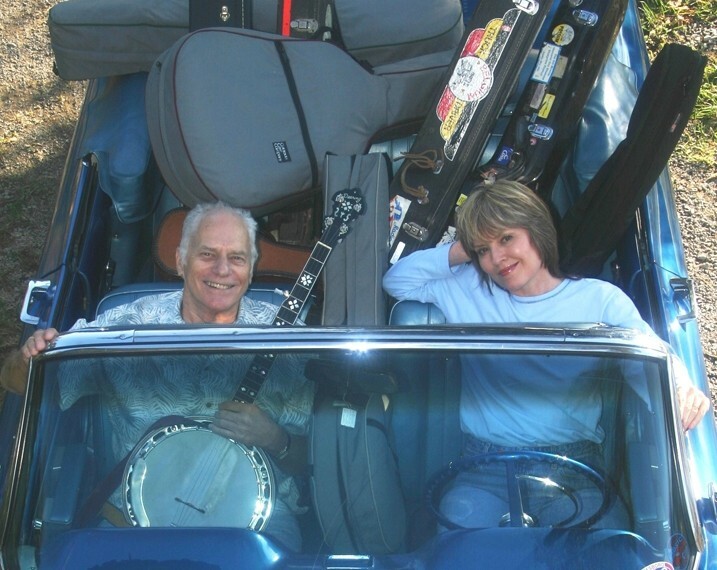 Bluegrass banjo great Eddie Adcock and his wife and musical partner, Martha, will play a couple shows in SLO County this week … even though they were just involved in a near-fatal car crash! Broken ribs be damned! Adcock was a member of the Classic Country Gentlemen in the 1960s and is the recipient of the 2014 Steve Martin Prize for Excellence in Banjo and Bluegrass. See him and Martha on Wednesday, March 25, at Last Stage West (6 p.m.; all ages; $15 presale at brownpapertickets.com or $18 at the door). He’ll perform and be interviewed by publisher/luthier Roger Siinoff, focusing on his background, playing styles, instrument choices, techniques, experiences, and more. On Thursday, March 26 (all ages; 6 p.m.; $18 presale at brownpapertickets.com or $20 at the door), Adcock will be performing a house concert at the home of Duane Inglish. Seating it limited to 40, and all proceeds will go to the Adcocks. Musician/composer Erin Inglish will open.